Free download Monument Builder Titanic game for PC. It is an arcade, business, simulation time management free game. Build the world’s most famous ocean liner! Download free full version game now! This time and resource management game is set in a typically Irish setting. It will show you a playful and clear vision of this prodigal construction site. Rediscover Ireland back in the day and take part in the enormous construction site of the famous Titanic. In Monument Builder Titanic throughout the 50 levels of scripted games, you’ll have to manage the workers you employ and train them yourselves. You have many carts and delivery vehicles to help you reach your targets. But beware! To reach your targets, you’ll have to get rid of bandits who have set themselves up on the roads, protect your site against robbers, and deal with local and foreign tradesmen. 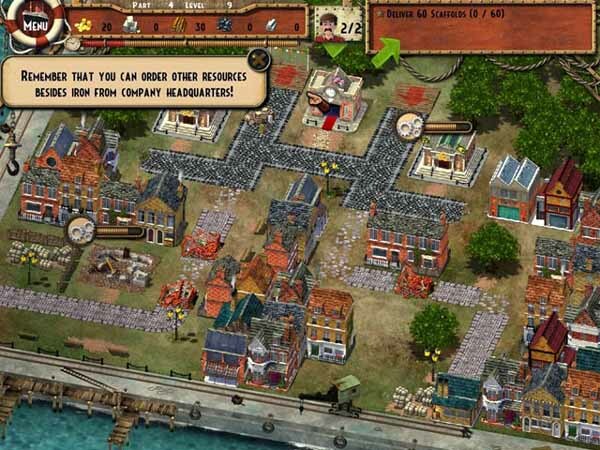 The game play of Monument Builder Titanic is similar to Age of Empires. You have to manage and develop your area. You need to train the units and construct the buildings as you need according to the situations. The game provides a good visual effect. It is easy to play and interesting to get involved in it as well. It is a freeware game by GameTop. The size of game is small and it can be run in almost every computer as it does not require high hardware to play. You need to gather enough resources to progress well and efficiently using your workers. If you are confused while playing, don’t worry, it will be okay just in a few minutes and you’ll learn to play this game speedily and efficiently. Make history with the world’s most famous ocean liner.